The Hadith states that Romans i.e. Christians were formed a majority of the people. That means Christians will be in greater number and will control the affairs and matters of the world, indicating that they will be in power. This is because they will have some qualities in them mentioned in Hadith. The first one mention is that they will pass suffering or trouble my great understanding and being judicious. The second is that if a calamity befalls on Romans they will be quick to recover. This can be because of support from fellow countries, aid or helping each other. Another quality describe is that they return to battle quickly after a retreat which can be because of better planning and organizing themselves according to the situation. Behaving well with poor and weak means that they will aid the poor countries or help them with technology and in terms of development. The last and final quality mention is that Christians will prevent oppression of their kings, they will be loyal and humble to them and will guard there kings or rulers. Mustaurid Qurashi reported: I heard Allah's Messenger (may peace be upon him) as saying: The Last Hour would come when the Romans would form a majority amongst people. This reached 'Amr b. al-'As and he said: What are these ahadith which are being transmitted from you and which you claim to have heard from Allah's Messenger (may peace be upon him)? Mustaurid said to him: I stated only that which I heard from Allah's Messenger (may peace be upon him). 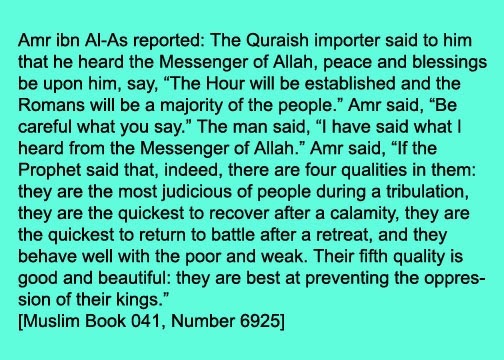 Thereupon 'Amr said: If you state this (it is true), for they have the power of tolerance amongst people at the time of turmoil and restore themselves to sanity after trouble, and are good amongst people so far as the destitute and the weak are concerned.